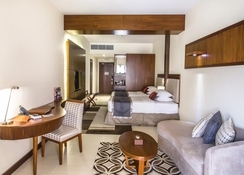 Whether you are a business or a leisure traveller, Western Hotel Madinat Zayed is an excellent place to stay, where your travel expectations are not only satisfied, but surpassed. The best aspect about this hotel is it gives attention to all your requirements no matter how big or small, which makes for a memorable stay. The hotel features a beautiful outdoor swimming pool, where you can have a refreshing swim. Take advantage of the hotel’s spa, where massages and beauty treatments are provided by expert masseurs. The restaurants and bars in the hotel will not leave any stone unturned by serving you delectable Arabian and international delicacies. 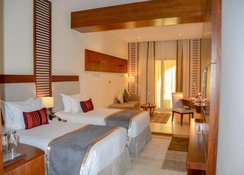 Western Hotel Madinat Zayed is situated in the heart of Abu Dhabi. It enjoys proximity to several shopping malls, beaches and international airports. 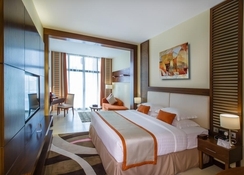 Some of the places close to the hotel include Madinat Zayed City Mall (1.8km), Abu Dhabi International Airport (151.4km), Al Marfa Beach (92.6km). 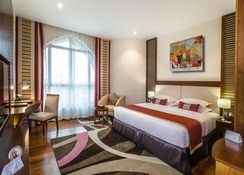 The hotel offers rooms in numerous categories to meet the needs of discerning travellers. 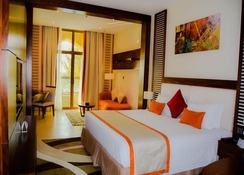 Rooms are categorized as Standard Room, Superior Room, Deluxe Room, Premier Room, Junior Suite, Western Suite and Royal Western Villa. All the rooms come with the following services and amenities that include 24-hour room service, Wake-up call service, laundry and express laundry service, concierge service, turn down service, high speed Wi-Fi internet, high definition (HD) 32” flat panel television, digital alarm clock, air conditioning individually controlled in room, large double wardrobe, coffee / tea-making facilities, bottled water, ice refill, mini-bar refreshment centre with a selection of premium food and beverage products, premium bathroom amenities, bathrobes and slippers, hair dryer vanity mirror, ironing facilities, walk-in shower, complimentary shoeshine service, electronic safe, full-size executive writing desk, international direct dial telephone, PC / laptop port, stationery, voice mail, daily newspaper (upon request), LCD television and satellite/cable television. The hotel features a plethora of restaurants, where guests will find something appetizing. Some of the bars and restaurants in the hotel include Cinnamon, Chutney, Flavors and Blue Water Café. Step into Cinnamon for an outlandish international buffet. Chutney is the right place to dine if you want to savour authentic Indian or Abu Dhabi delicacies with a scrumptiously modern twist. At Flavors, you can experience the essence of generosity, it offers delightful savoury treats, which can be accompanied by a fabulous selection of teas suggested by the tea sommelier. From mouth-watering oven pizzas to delectable sandwiches, each experience will be a memory to cherish. There is a wealth of sport, recreation and health facilities in the hotel to keep the guests engaged on their stay. The fully-fledged Life Fitness Health & Recreation Club is a place to be for revitalizing your life, escaping from day to day stress and shaping up your body. It comprises expert trainers, who provide Personal Fit Training, Freestyle Training, Cardio Training, Strength Training, Aqua Aerobics and they also offer swimming classes for adults and children. Relax in pure serenity at the outdoor swimming pool, which is surrounded by splendid gardens to create a peaceable atmosphere. This family-friendly hotel also comprises a temperature-controlled swimming pool and children’s play area, so that the younger guests can have a delightful time.